Todd, Josh, Cody and Melissa play strip poker. Helen comes in just as Todd and Josh pull their boxers off. Helen recoils in surprise and Cody shouts that it was just a game. Helen quickly closes the door again while the gang scramble to get dressed. Outside the door, Helen dissolves into giggles. Inside, Todd and Josh panic while the girls laugh. The girls run off through the back door while Todd and Josh sit down to play a safer game - Snap! Melanie has come round to apologise to Christina for not believing her about Kelvin. She tells them what happened and tearfully asks if they can be friends again. Melanie despairs of ever finding Mr Right - her heart always gets stomped on, no matter who she chooses. HELEN: And you have your clothes on. That's nice. Helen has guessed that they were playing strip poker and tells Todd that it's not an acceptable pass-time. Todd begs her not to tell Jim or Melissa's parents. Just then, Beverly and Jim come home. 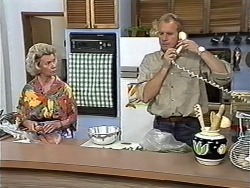 Helen goes to help Jim make the tea in the kitchen. Paul and the twins are having breakfast. Christina has some tickets to a movie, but no-one is free to go with her. 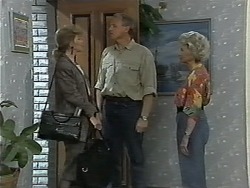 Beverly is leaving for the conference today, and Jim says he'll come home this afternoon to see her off. When everyone has gone, Helen calls to Todd that it's time for school. 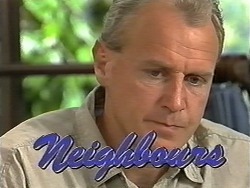 Paul comes in and see that Helen has a letter in Gail's handwriting. HELEN: She's fine. Good. Settling down, making friends. HELEN: Oh, I don't know about that. Paul picks up a photo that's come with the letter. There's a bloke in it with Gail and kids. Paul is upset. HELEN: Oh darling, try to be happy for them. PAUL: Gran. My kids calling someone other guy daddy? Yeah, sure. I'm ecstatic. Paul is in a very bad mood and tells Melanie off for writing poor letters. She bursts into tears. Caroline tells Paul off for being nasty to Melanie and points out that Melanie is very upset about Kelvin. Paul snaps that he doesn't give a damn about Melanie's problems and he wants his money's worth from her. CAROLINE: Just because you're a machine, Paul, can't you imagine what it's like if the person that you loved was seeing somebody else? Paul explains about the letter from Gail and the photo with the kids. Caroline sympathises. Helen is surprised that Beverly is taking so many clothes to the conference. Beverly says she's going to make the most of the trip to Cairns. Helen has touched a nerve though and Beverly starts banging on that there's nothing going on with Ewan. A client has cancelled and Paul isn't happy. He rages around the office much to Caroline and Melanie's dismay. Jim and Matt are having a chat. Jim has been away from the garage quite a bit lately and Matt is upset - he can't learn anything while Jim isn't there. Paul has come back from a meeting in a better mood. He apologises to Melanie for yelling at her earlier. He symnpathises about Kelvin - he's still cut up over Gail even now. Melanie starts to cry and Paul offers his hankerchief, telling her it does get better. Then he gives her a hug as Melanie sobs. 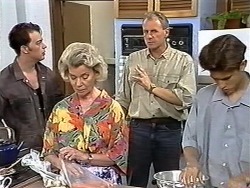 Jim tells Helen that he's still upset about how well Beverly knows Ewan from her youth days. Helen tells him he's being silly - it's like Beverly becoming jealous of Anne. Paul is moping around while Christina tries to persuade Caroline to go to the pictures again. Paul finally relents and agrees to go with her. In fact, he says they should do dinner, drinks, the lot! Just then the phone rings - it's Ewan calling for Beverly. It seems that Beverly forgot to pick up some statistics, and since she's already left, Ewan says he'll get them to her himself, tonight. 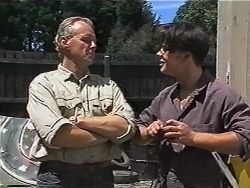 Jim is angry that Beverly lied about Ewan joining her in Cairns. JIM: The two of them up there together. What sort of sucker am I?